People who have MRSA bacteria living on their skin are called MRSA carriers. Carriers may never become infected, but they can spread the bacteria to others. This is the first of a 2 part series on the use of Chlorhexidine as a skin wash and MRSA decolonization protocol. In the news lately are more scientific studies confirming the level of resistance of MRSA and Staphylococcus aureus bacteria against the antiseptic skin cleanser called chlorhexidine gluconate, or CHG. Chlorhexidine gluconate washes are commonly prescribed to help prevent MRSA infections and help in skin decolonization for MRSA. CHG is normally well tolerated, but it does have some important precautions you should know about, including some occasion serious side effects. A new study was released about caring for children with MRSA or Staph (and I’ve included some precaution tips below). This study shows that family members are nearly 10 times more likely to be colonized by MRSA bacteria if they have a child with a Staph infection in their household. The Washington University School of Medicine study also shows that household members are more likely to be colonized with Staph aureus than the general public as well (Arch Pediat Adoles Med. 2012; 166(6): 551-557). If you’ve lost time from work because of Staph or MRSA, then you know the stress, uncertainty and frustration these infections can inflict. On top of the often high cost of treatments, lost income from missing work can cause a huge financial strain. Are Staph bacteria living in your nose? A favorite place for Staph and MRSA bacteria to live and grow is in your nose. Bacteria like Staph love moist and warm places like the nose, upper respiratory system, groin and arm pits. Staph can live in your nose and not cause a nose infection, however many people get sores and infections in their nose. For kids, the nose can get a lot of “finger traffic” which can spread Staph bacteria around to other surfaces they touch. 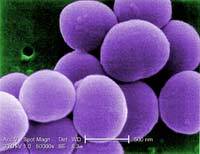 Because Staph aureus (the bacteria responsible for MRSA) live in the nose of about 30% of all people, it’s why Staph nose infections are one of the most common types of Staph infections.